Postcard from Ruggero Bacci, written in Italian, to his son Aldo Bacci, October 9, 1941. Internee Bacci writes to his eldest son, Aldo, that he is pleased to hear that he is continuing his studies part-time, after work hours. He warns Aldo not to overdo it -- to remain mindful of his health. Due to his father's internment, Aldo was forced to quit high school to help support the family. In the postcard, Bacci also asks his son to help his mother and brother the best he can. According to family, Bacci's wife Erminia (Minnie) suffered a serious nervous breakdown and was hospitalized at length. Bacci notes that Aldo is providing a good example and necessary sacrifice in difficult times. 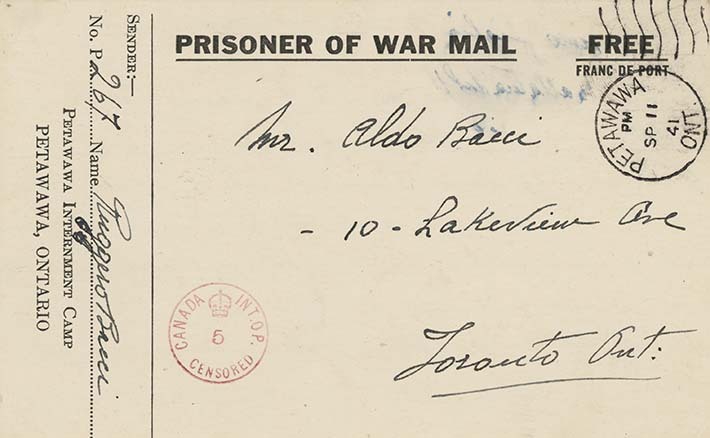 When his father was released and returned home, Aldo received notice that he was conscripted into the Canadian Army; however, he did not serve overseas.